Intrinsic Aging Vs Extrinsic Aging. Why you should listen to your nurse! Don’t forget sunscreen, don’t smoke, don’t poke at your face, don’t drink too much alcohol, don’t forget to wear sunglasses! Bossy pants experts spout out orders all over the place. Have you ever thought, I look hot now so what harm will a little sun and little social smoking do? Let me explain the difference between Intrinsic Aging and Extrinsic Aging. Intrinsic Aging is the natural occuring process by which our youth crumbles. Thank your mother, because her genes were gifted to you as well as her sagging jaw line and under eye bags. Intrinsic aging can be done beautifully by eating a very healthy diet full of greens and healthy fats, drinking half your body weight in ounces of water a day, and exercising. 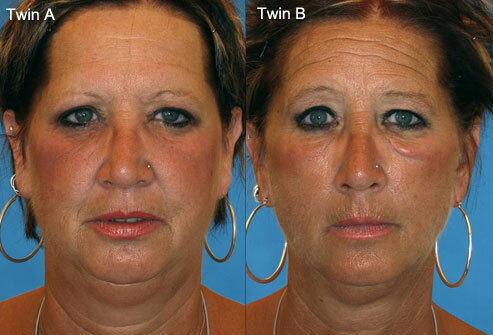 Extrinsic Aging is the low down and ugly youth crushing effects of your own lifestyle indulgences. 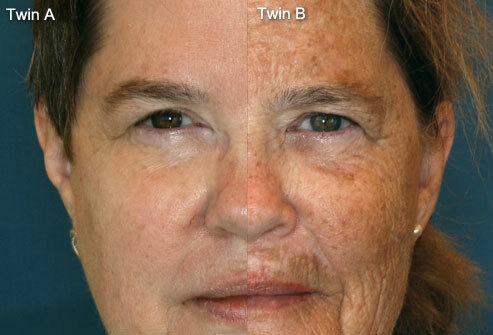 Extrinsic aging is brought down on you in the form of sun spots, wrinkles, and thickened skin. Think of this the next time you forget to put on sunscreen or think that just one night of debauchery won’t cause any ill effects! Fight extrinsic aging by avoiding the sun, cigarettes, marijuana, and making fun of overweight cheerleaders at your 20th high school reunion. Now for the twin studies! This entry was posted in anti-aging, skin care and tagged Aging, Intrinsic and extrinsic properties, Motivation on July 9, 2012 by Derma Darling.